From the 2.66-mile Talladega Superspeedway, the transition to the Martinsville Speedway 0.526-mile short track could lead to another unpredictable event in the second-half of the 2011 NASCAR Sprint Cup Chase for the Cup. While the official Friday qualifying session for the NASCAR Sprint Cup's TUMS Fast Relief 500 was rained out, the starting line-up for the Martinsville Speedway event was decided on car owner points. Carl Edwards' recent storming run to the top of the Chase standings secured the top spot for Sunday's event. 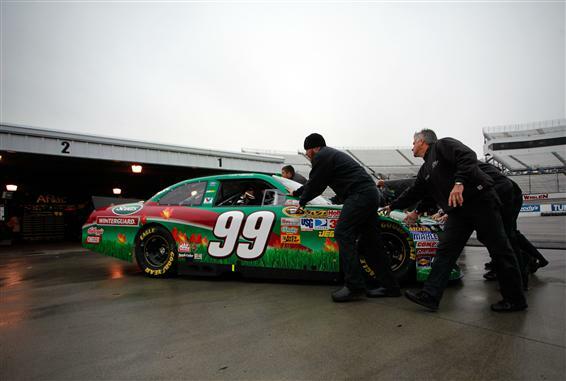 Regarded as a historically tough race track for the #99 Ford, Edwards has an average starting spot of 18.2 out of 14 races. As Carl Edwards seemingly dodged a major bullet in acquiring starting position for the TUMS Fast Relief 500 at Martinsville Speedway, so did his teammate Matt Kenseth in the #17 Ford. For the Roush Fenway Racing team, their last win at the Martinsville Speedway track in Sprint Cup occurred in 2002 with Kurt Busch driving the #97 car. With all 12 Chase contenders lined up at the top of the field, the 500 laps at Martinsville Speedway could prove to be a challenging situation for one driver to gain a major advantage on rivals. In a session led by the #66 Toyota of Michael McDonnell's top time of 19.747 second or 95.893 miles per hour, the pivotal prep for the NASCAR Sprint Cup Series event. Following final practice on Saturday afternoon, the plot for Sunday's race thickens as only 3 of the Chase's top-12 drivers placed in the top-10 fastest cars. All from the stables of Hendrick Motorsports, Jimmie Johnson led the driver grouping with a 3rd fastest in the session driving the #48 Chevrolet. Ninth fastest on the race track practice was Jeff Gordon #24 Chevy while the #88 car of Dale Earnhardt Jr logged a 10th quickest time. Winning 10 of the 13 NASCAR Sprint Cup races run at the Martinsville Speedway short track from 2003 to 2009, Hendrick Motorsports has been winless in the past 4 visits by the series. Both Johnson and Earnhardt logged more than 100 laps on track at Martinsvile Saturday afternoon. On a recent hot streak at the Virginian short track is Denny Hamlin. Though he finished 12th during the spring race at Martinsville, Hamlin drove his #11 Joe Gibbs Racing Toyota to three consecutive wins at the 0.526-mile oval. Involved in the Chase but largely out of contention for the title, Hamlin was 14th fastest in Saturday practice. Other Chase for the Sprint Cup notables in the practice for the NASCAR Sprint Cup race at the short track includes Kurt Busch registering 11th fastest, Kyle Busch in 15th, while the front row-starting Roush Fenway Racing group cars were 24th and 29th quickest with Matt Kenseth ahead of Carl Edwards. Fourth to last on the 2011 NASCAR Sprint Cup series season, the TUMS Fast Relief 500 at Martinsville Speedway has a race start time of 2pm Sunday.